New innovations in portable solar technology magnetic solar panel connections: Unlike other chargers which have fixed connections between panels which tend to experience wear and tear (and therefore lose efficiency), solar paper's magnetic connections reduce wear and tear to an absolute minimum. In addition, they enable very easy charger upgrades: Simply click in two additional panels to achieve an increased capacity of 5w. With all other options, you'd have to buy an entirely new device. Lcd screen: For solar paper, we've included an lcd amp meter that shows exactly how much current is flowing from the charger to your device at any time. We wouldn't include this lcd if we were not absolutely confident about our technology and our product. No false advertising. No false promises. Also, by monitoring the current display on the lcd screen you can ensure the best possible angle for faster charging. Dramatically improved design: Until now, solar chargers have either been bulky and heavy or inefficient. 'Solar paper' is a design revolution in the portable solar charger market. As well as being more efficient and robust enough for the outdoor market, the charger weighs only 4oz and is super portable. YOLK is an innovative solar power company. 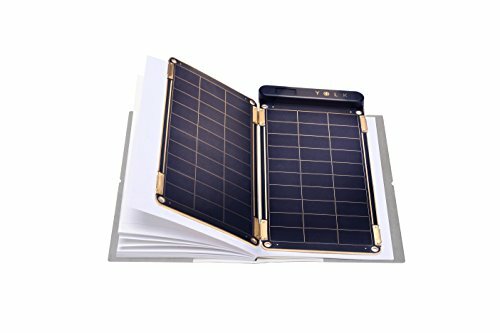 We recently launched "solar paper, the world's thinnest and lightest solar charger" and got funded over $1 million dollars. With our highly advanced technology, solar energy will not be limited for users that enjoy outdoor activities. Our goal is bringing solar technology into everyone's daily life. AUTO RESET TECHNOLOGY: Users don't have to unplug and replug the cable every time a cloud passes overhead or you walk through a shadow. This is very inconvenient. We wanted to make Solar Paper as easy as possible for anyone to use, so we have integrated 'auto-comparison technology' into the charger, to make it automatically resume powering your devices, after the sun starts soaking it again. If you have any questions about this product by YOLK, contact us by completing and submitting the form below. If you are looking for a specif part number, please include it with your message.